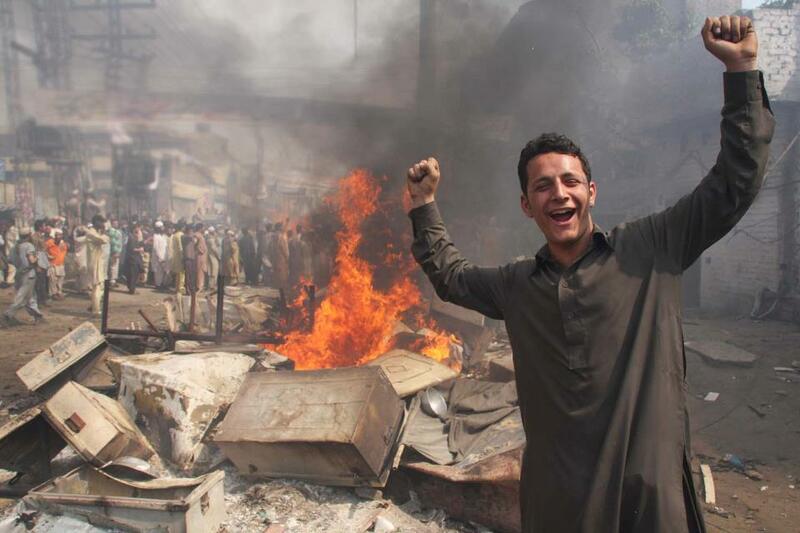 The most recent Blasphemy related violence which hit Christian neighbourhood of Joseph colony in the Eastern city of Lahore on the 9 March, 2013 in Pakistan is another sad episode of religious minorities under attack. Minorities are deemed as soft target in the hands of majority in a volatile climate of Pakistan who are steeped into abject poverty and lay open and vulnerable into the hands of their masters. Their houses, children, properties, Churches and above all their “dear lives” are under ceaseless threats. More than 3,000 angry Muslim mob when attacked the Christian houses was under the veneer of land grabbing and material benefits is an utter violation and attack on the freedom of religion as expression. It is estimated that more than 178 Christian houses were torched and hundreds of Christians were forced to flee. Several shops were set ablaze and , three Churches in the neighbourhood were burnt and Christian properties were damaged. Today Christian world celebrates Easter. The resurrection of Jesus and His victory over death is being remembered and celebrated across the world. Which gives hope of life when hopelessness exists around us. The promise of Christ’ life over death will be preached from the pulpits and millions of Christians will celebrate the joys of being the follower of a Triumphant Leader. I began to ask myself a question as what would be the meaning of Easter to the residents of Joseph Colony and those across the world who are subject to discrimination and violation. From the charred houses of the Joseph Colony to the burnt pages of the Bible. The message of Hope of the Cross and Easter is far from the reality these poor residents witnessed once through the smoke which once blurred their eyes on the day of tragedy. Unfortunately, for many of the persecuted minorities across the world, be they religious, lingual, ethnic etc. “persecution” is the way of life. It is like a pest they grow up with. The more they want to deal and see the end of it, the more they are swamped by it. There is no way out of them. In Pakistan religious festivals are often celebrated under the watchful eye of security detail, behind the shadows of guns and police due to the fear of any target killing or suicide bomb attacks. This Easter the residents of Joseph Colony will be reassured to live their lives more focused to the Cross of Calvary than ever before. Their Christian faith must have been rooted not in the foundations of their newly built homes but their lives are more and more grounded with the true hope, life and the victory of Christ and his unexampled triumph over death. This year, The Easter in Joseph Colony would be different, both in its meaning and celebration. They are constantly reminded of the hope they have in Christ. Regardless of their deprivation, suffering, pain and pangs of persecution, they are more and more grounded in their Christian Faith. The very tragedy which hit their homes and lives would be source of strength to them. Just like Jesus, who had to leave his home and undergo the suffering and carry the burden of Cross in a way to glorify the purpose of God in His life. In the same manner, the lives of these poor residents, even though fearful but yet more committed to the cause of the Cross. Hoping and Believing that the pain and the suffering they had to go through will not be repeated once again for their posterity. Government of Pakistan has to take mammoth steps to heal the wounds of Christian community who are subject to institutional discrimination and victimization or else any other Christian Community in Pakistan can be made another ” Joseph Colony”. The Easter celebration will be passed away. Their houses will be built upon, Easter gifts will given and forgotten. What lesson did we learn from the tragedy of the Joseph Colony this Easter? This entry was posted in Articles, Pakistan, Persecution, Spiritual Articles and tagged Christian, christian news blog, Persecution, Shekinah, ShekinahToday. Bookmark the permalink.